The Faroe Islands are a small archipelago of 18 islands situated between the North Atlantic Ocean and the Norwegian Sea. The islands are also located almost halfway between Iceland, Norway, and the Shetland Islands. The islands’ name in Danish (Færøerne) might be derived from the Old Norse term ‘fær’ (meaning sheep) plus ‘øerne’, the definite plural form of Danish word ‘ø’ which means island (briefly, that would mean ‘Sheep’s Islands’). 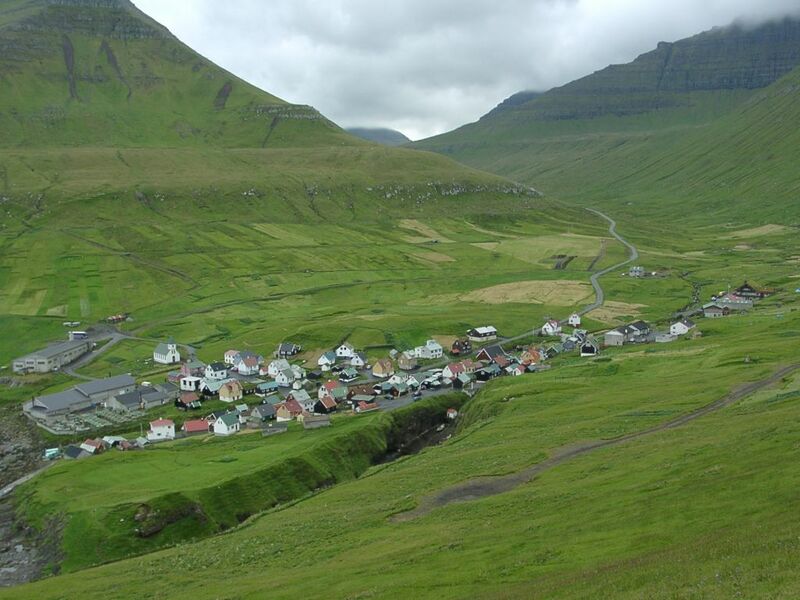 In Faroese, the term the islands are referred to is ‘Føroyar’. 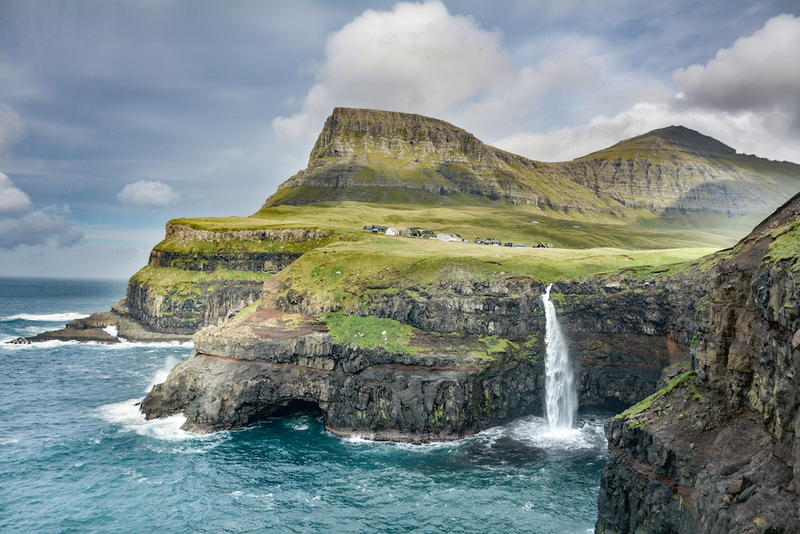 The climate of the Faroes is characterized by cool summers and mild winters. Even though the archipelago has quite a high latitude, the Gulf Stream ameliorates from time to time the rather frequent, dense, foggy and rainy weather. The predominant type of climate is the subarctic oceanic one (Cfc, according to Köppen climate classification), but the Arctic one (ET, according to Köppen climate classification) can also be remarked in the cases of some of the islands’ mountains. The vast majority of the territory of the Faroese archipelago is rocky and rugged, with very high cliffs (the most highest from Europe and one of the most highest globally). The islands themselves were formed roughly 55 million years ago through volcanic eruptions that resulted in three layers of basalt that define the geologic composition of the archipelago. Unlike Iceland, the Faroes are entirely located on the Eurasian tectonic plate. The lowest point in the Faroes is the sea level whereas the highest one is represented by Slættaratindur (that translates as ‘flat peak’ in English) mountain which lies in the north of the island of Eysturoy (having an elevation of 880 metres above sea level). The Faroe Islands were initially settled during the early Middle Ages by Irish and Scottish hermit monks (most likely part of a Hiberno-Scottish mission sent to the north of Ireland and Scotland). Just like the case of Iceland, these Celtic-speaking monks were followed some centuries later by the Norsemen, who permanently settled the archipelago during the Viking Age and brought their culture, folklore, religion, and architecture (highlighted most prominently by the turf houses) from native Scandinavia. The Norsemen who colonized the Faroe Islands were mostly of Norwegian descent. Nowadays, genetic studies reflect the common Norse-Gaelic lineage of the Faroese, where the native male population is predominantly Scandinavian in origin whereas the female population is of Scottish ancestry (given the fact that the Norse brought Gaelic-speaking thralls from Scotland to the islands after their incursions in northern Britain). The total population of the Faroe Islands amounts to nearly 50,000 inhabitants (as of 2015). Of these, the vast majority are ethnic Faroese. 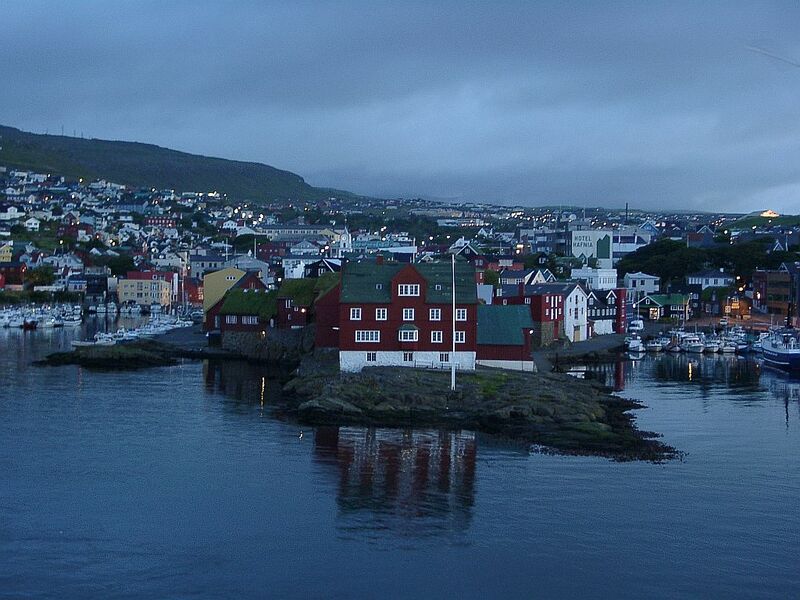 The capital and also the most prosperous city of the Faroe Islands is Tórshavn (spelled ‘Thorshaun’) on Streymoy island, with a population of almost 13,000 people (as of 2015; a figure concerning only the city proper). The islands are also dotted with many small villages and hamlets. The native language of the archipelago is Faroese, one of the least spoken Germanic languages worldwide. The Faroese language shares a great deal of linguistic similarities with Icelandic, another insular North Germanic language, and with some western dialects of Norwegian. Additionally, alongside Icelandic and Elfdalian, Faroese is also one of the least spoken North Germanic languages from the states and autonomous territories that form the Nordic Council. As a matter of fact, with an estimated total number of native speakers around 66,000, Faroese is the second least spoken Germanic language worldwide (just after Elfdalian in Sweden). Besides Faroese, English and Danish are widely spoken and understood in the Faroes. Due to the rough and rigid terrain of the archipelago, linking an island with another through tunnels wasn’t possible until relatively recently. So it is that various sea tunnels represent an important part of the Faroese land infrastructure, as there are no railways. Transportation by the sea is facilitated by ferries and by air by helicopters as there are no major airports except for Vágar Airport. There are more than four hundred different species of plants in the Faroes but no native forests. Most of the Faroese lowlands are mainly green and covered with grass. As for the flora, given the remote location of the Faroes in the North Atlantic Ocean, there are many sea birds (such as puffins) and other marine animals (such as grey seals). Geopolitically, the Faroe Islands are an autonomous territory of the Kingdom of Denmark since 1814 (after the Treaty of Kiel). Together with other autonomous territories, such as the Åland Islands or Greenland (the former belonging to Finland while the latter to Denmark as well), the Faroe Islands are part of the Nordic Council.